Phyllis Galembo is Professor of Art at the University at Albany, State University of New York. Her photographs have been exhibited widely, including at the Schomburg Center for Research in Black Culture, the American Museum of Natural History, and the Fashion Institute of Technology (all in New York City); the Kréyol Factory (Paris), Museum fur Völkerkunde (Vienna), Smithsonian National Museum of Natural History (Washington, DC), Tang Museum (Saratoga Springs, NY) and the Tokyo Metropolitan Museum of Photography. Her work has been collected by institutions including the US Library of Congress, The Metropolitan Museum of Art, New York, and the Yale Center for British Art. In 1994, Galembo received a Senior Fulbright Research Award to photograph “Kings, Chiefs and Women of Power, Nigeria,” and has authored several other books. Her most recent monograph, Phyllis Galembo: Maske (London: Chris Boot Ltd, 2010), features a selection of her photographs and commentary, and an introduction by art historian and curator Chika Okeke-Agulu, himself a masquerade participant during his childhood in Nigeria, for whom Galembo’s photographs raise questions about the survival and evolution of masquerade traditions in the twenty-first century. 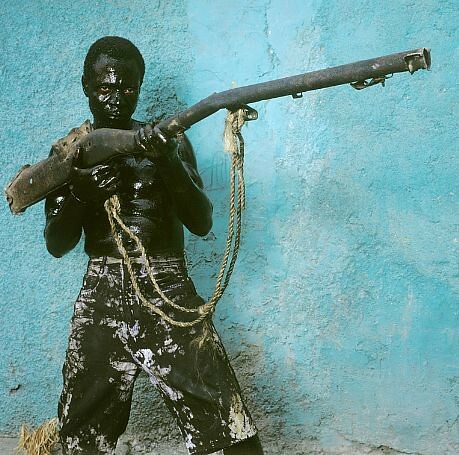 American photographer Phyllis Galembo has traveled extensively in the Caribbean and Africa to witness and document rituals that involve extraordinarily creative masking and costuming. Over the past twenty years, she has traveled to the Republic of Benin, Sierra Leone, Nigeria, Brazil, Cuba, Jamaica, and Haiti to photograph traditional priests and priestesses, carnival masqueraders, dancers, and Haitian vodou practitioners, wearing elaborate costumes created for weddings and burials, initiations, chiefs’ coronations, protests and holidays. Galembo’s portraiture illuminates the transformative power of costume and ritual, while privileging the creative agency of individual performers. She works in the tradition of the staged portraits of Edward Curtis and the ethnic fashion studies of Irving Penn. However, unlike Curtis and Penn, she does not carefully arrange her subjects in a studio setting. Instead, transporting her equipment and cameras to the very sites of public display themselves, Galembo chooses existing local backgrounds, such as the wall of a home or the trunk of a tree, engaging her subjects as they pose “in character.” It is this dynamic between Galembo, her subjects, their locale, and their performances that combine to give us the composition, meaning, and tenor of Galembo’s images. Galembo’s work shows the interconnectedness of fashion and performance, the vernacular and the sacred, and the combined power of traditional and modern materials, symbols, and gestures. The rituals and costumes she documents vary in complexity: practitioners may spend a year gathering materials and sewing elaborate costumes to be worn for a single day, or they may spontaneously paint their jeans and bodies to join ad hoc in displays of play and protest. Her subjects, donning costumes improvised from materials found in their immediate environment, transform themselves to embody personalized visions of mythical or religious figures. In revealing the raw material and contemporary aspects of ceremonial garb, Galembo’s images highlight the ingenuity of the individuals who remake themselves as fantastical beings, while showing how their creativity and personal identity are nevertheless rooted in the larger dynamics of their religious, political, and cultural affiliations. Shedding light on these connections is a hallmark of Galembo’s work.